I'm sure, like me, many of you have encountered executives who say, "social media isn't for B2B!" They understand how social media can benefit a large consumer brand that seeks publicity and mass appeal but don't see how it can help a B2B business like theirs. Historically, I would have launched into a discussion about multiple touch points, shortening sales cycles, supporting information frameworks, etc, and perhaps lost them somewhere around point 23. Now, however, I am likely to start by saying, "think of social media performing like account management." I find this sets their minds in the right frame for our discussion. Here's where it usually goes from there. Let's start with a delineation of what account management does (or tries to do). In essence an account manager tries to build a relationship with a customer to learn more about the customer's business and teach the customer about his company in order to grow the amount of business that customer does with his company (or secure the next piece of business from the customer). That's an oversimplification, but it covers it. Now, how can social media deliver benefits like account management? Engagement that builds relationships is (probably) what most people think of when discussing the benefits of social networking. And building strong relationships is even more important in the B2B world than in B2C. Social media management can increase the number of touch points an organisation has with a customer, both individually and across the organisation. Normally, a customer interacts with a company via an account manager over the phone, email, in meetings, and perhaps at the occasional industry gathering. With an active corporate social media undertaking the interaction with the account manager spreads to include things like Twitter conversations, LinkedIn discussions, blog comments, and more, extending the opportunities for deepening the relationship. But through social media the company is also able to spread touch points across different parts of the organisation (customer service, product development, the CEO even), allowing the customer a broader understanding of who he or she is doing business with. If I'm thinking of spending many thousands of pounds (dollars, euros...) with a company, I want to feel certain that that company will follow through on what it says it will do. 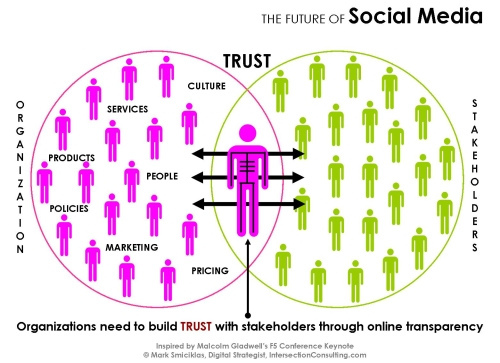 The relationship built through social media helps build trust between the company and their customer(s). "Teaching" isn't the best term here, but when I say an account manager "teaches" a customer I'm referring to helping that customer understand the fuller set of capabilities, products, or services that their company can offer. The b2b social media equivalent to this lies in creating helpful, informative content. This may be in the form of blog posts or videos, active Twitter discussions, or answering questions on LinkedIn, Quora or industry forums. Through this sort of content creation, an organisation demonstrates to its customers (both actively and passively) that it is knowledgeable, skillful, helpful, and an expert in its field. This backs up what the account manager has been saying and gives the customer greater confidence in the company, which may help secure the deal (or at least shorten the sales cycle). Good account management also should spend time trying to learn as much as possible about a customer, should try to understand the customer's business and the people in it. Through these efforts the account manager is able to better meet the customers needs and to find new sales opportunities . In social media this is achieved by building good, engaged relationships with customers (see above). But it is also achieved by listening to the conversations taking place in the social spaces; conversations about our products or company, our competitors, or our industry. These conversations might not always be about us but they may give us insights into what is causing our customers difficulty (the classic "pain points") or what would make their life better. It is through all of the efforts described above that social media can help grow business with customers by creating meaningful relationships and deepening the understanding between each other. And, as any good account manager will tell you, all the relationship building or listening and learning will do you little good if you aren't able to recognise and capitalise on the business opportunities. The same is true with social media; if you aren't able to glean actionable insights from the engagement and interaction you won't have as successful a social engagement programme as you could. And by "actionable insights" I mean things that you can do to make your customer experiences better; better products, better service, better marketing, better responsiveness, and better sales experiences. And, while it's true account management is usually about sales opportunities only, if we are prepared to learn from the insights gleaned from the social spaces, we have a chance to transform across the board into truly customer-centric organisations.